Here is what is going on. 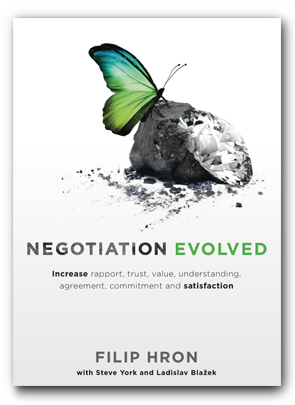 In negotiation there are very few insights that are always right. Rather, as we discuss in the book, we need a situational approach that acknowledges that the situation and context determines which negotiation insights will be most relevant at any particular point in your current negotiation. So the previous blog entry highlighted how keeping a relentless focus on the prize can help parties move negotiations along despite feelings of regret, resentment, hurt, blame or desire for revenge. But sometimes the other party’s relentless focus on their prize is the problem. Specifically when their prize (or “desired outcome”) is for you to lose the negotiation. Consider the playful tug of war over a tennis ball with your dog. The more force you put into getting your prize, the more force your dog will put in. Does your dog want the tennis ball? Yes. But perhaps your dog specifically wants the tennis ball because you want it, or because it enjoys the game. It is simple, primitive and innate competitive behaviour. So what happens when you act uninterested and walk away? That’s right, sometimes your dog will walk up to you and leave the ball at your feet! The ball is now yours… until you want it… and now the competition resumes! And what happens if you in the middle of the tug of war let go of the ball and instead pet your dog and rub it behind the ears and on the tummy. Your dog’s internal dialogue instantly changes from “Must have ball!” to “What ball?” Its eyes are off the prize, and again the ball is yours – this time without the dog knowing (or caring about) what happened. So how is this relevant for negotiation? Well, in circumstances when the other party is ultra-competitive and specifically uses the success criteria that you have to lose, we may actually wish to avoid negotiating head-on. We specifically do not want their eyes on the prize. Imagine going to a gym and trying to negotiate to get 2-3 weeks free trial training instead of the regular 1-3 day pass. Any attempt to increase the number of free days is very likely to be met with resistance. But what if you change the interaction? What if you e.g. share that you are prepared to join, but later share your apprehension because you fear that you might discover that you not like the gym. Chances are that the sales person, now focusing on closing a sale (not the free trial), will try to get you to sign by offering a sweetener such as: “Ok, would you sign now if we offer a guarantee that if you don’t like the gym after 2-3 weeks you get your money back”. Isn’t that funny? Did you get what you want? Yes. Can you train for free for 2-3 weeks? Yes. Do you have to commit to more? No. Does the sales person think he or she lost the negotiation about the free trial? No. So were you met with resistance? No. Instead the salesperson gave you exactly what you wanted. And you didn’t even ask for it! Note that the lesson in this blog post is not really about negotiating gym memberships. It is about dealing with ultra-competitive negotiators by having them not realize that they are in a competition. So… where else can you use this insight…? At the end of the negotiation we certainly wish to ensure that all parties involved leave with the same understanding of what we have agreed to. But until we reach this point in the negotiation we are dramatically more likely to make the opposite mistake; to assume disagreement when there is none. This assumption has the unfortunate property of triggering a destructive negotiation pattern that we are all guilty of. Once we assume that our opinions are incompatible we become preoccupied with supporting our position in order to win. Insights from psychology explain that we lose objectivity at this point, and effectively try to manufacture or manipulate available evidence to support the view we already have. In the process we pollute the interaction with assumptions, accusations, judgements and anything else that we can find to make us feel like winners and make the other side look like losers. So what can we do instead? Well, instead if assuming disagreement, negotiators assume misunderstanding. Rather than assuming that our opinions are incompatible, we assume that we simply haven’t yet understood out how they are compatible. Additionally, we fight the (delicious) temptation to blame the other party for not understanding us. Rather we assume that we don’t understand each other. The process we chose to follow is one of letting all parties clarify their opinion, and confirm that they understand the opinion of others. It helps create a healthy mindset for negotiation to assume… no…. to believe that this process can always lead to agreement.